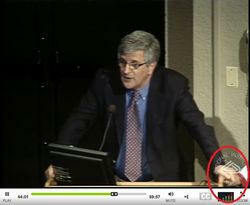 Like Seth Mnookin did earlier this month, Paul Offit blatantly lied about me while giving a lecture. 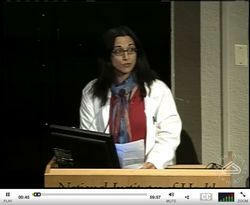 The congressionally reprimanded millionaire vaccine industrialist told a room full of people I was a “stalker,” and event organizer, Dr. Tara Palmore had me escorted out of the “Great Teachers” lecture given by Paul Offit at the NIH on December 14, now on Videocast. My crime: Asking Dr. Offit a challenging question and then pointing out one of the fallacies in a statement he made after dodging my question. Drs. Offit and Palmore also had a little talk about me at the end of the lecture, which was recorded onto the VideoCast, unbeknownst to them. It all began when I found out online that Paul Offit would be speaking at the NIH, part of the “Clinical Center Grand Rounds – Great Teachers Series,” sponsored by Johns Hopkins School of Medicine. The title of Dr. Offit’s lecture was “Communicating Vaccine Safety Science to the Public.” He’s also author of the now infamous claim that an infant can safely take 10,000 vaccines at once. So I took the metro out to the NIH in Bethesda, Maryland, just as I did for the talk given by Fiona Godlee. As I took my seat, I saw Paul Offit in person for the first time. Dr. Palmore – associate director of the Infectious Diseases Training Program for the National Institute of Allergy and Infectious Disease - gave a grand introduction to Dr. Offit and described how he has bravely taken on the “anti-vaccine movement” (even though most vaccine safety advocates are not against all vaccines). She called him a “Rock star in the pediatrics and infectious diseases communities.” He’s more like Ronald McDonald for the vaccine industry. She also introduced his son who was with him and looked college-age. Despite the estimated $10 million Paul Offit earned from RotaTeq vaccine sales and despite his Merck-sponsored chair at Children’s Hospital of Philadelphia, his lecture began with his incredible claim that he has no relevant financial disclosures. He even received a congressional reprimand for taking part in voting on vaccine policies for which he is conflicted. 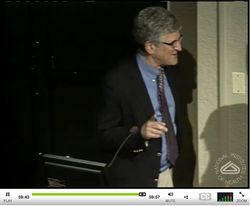 When Paul Offit’s presentation ended, the question and answer session began. 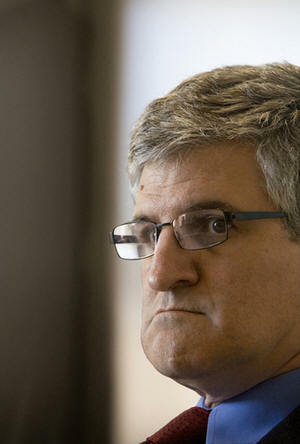 A woman sitting near me asked Dr. Offit if he recommends “scare tactics” (which he favored). At that point I went to the microphone, ready to ask my question. Just then, as you can see in the VideoCast, Dr. Palmore – in a white lab coat – bolted from her second row seat and dashed towards the back of the room, out of camera shot. (43:12) That’s how quickly she decided I had to go – all I’d stated was my name and where I go to school. Fortunately, I had time to ask a quick question before being evicted. At this point, Dr. Palmore’s hand can be seen resting on his podium (44:01). She shadowed him for the rest of the talk, literally. Her shadow hovered next to him – as if to guard him from other unauthorized questions. Seeing that he dodged my question about Andrew Wakefield and instead rehashed several of his talking points, I decided to challenge him on one of them. I mistakenly said “two” instead of “three,” but it hardly mattered. As with my original question, he did not address my point at all. This time, however, he got personal. “So maybe, just for those of you…because this is a good teaching point actually. There are many things you encounter when you stand up for vaccines. You get, uh…sometimes you get hate mail. Sometimes you get sued. And sometimes you have a stalker. I have mine; his name is Jake Crosby.” [pointing at me as if to make his lie true]. “Life goes on,” he says philosophically - as his henchman escorts me out - but thanks for plugging Age of Autism, Dr. Offit. Of course, it’s okay for Paul Offit, the vaccine industry’s number one spokesman, to vilify Dr. Andrew Wakefield, Jenny McCarthy, Oprah Winfrey, David Kirby, Myron Levin, parents of vaccine-injured children and me. “No, he hasn’t,” I said back, as she was obviously lying to cover for the ultimate liar in the room. 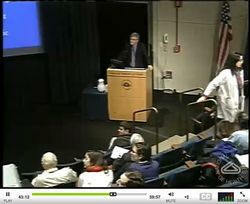 Of all the people who stood up to ask Paul Offit questions, I was the only one who was not shown on camera. The scene of me being forced out of the “Great Teachers” lecture did not make the final cut – maybe because it would make the “teacher” look not so great. I later saw on the VideoCast that Offit’s “stalker” claim was believed by audience members - just like his other lies. “Hi, thanks for your talk and congratulations on having a stalker,” a man said. Dr. Offit seemed to be taking pride in his lie. Having been sued twice already for defamation, he just doesn’t seem to learn. Calling someone a stalker, according to Maryland Law, is a very serious accusation. The question that directly followed mine was probably not what Dr. Offit was hoping for. An apparent acquaintance of his, “Phil” lamented that it’s the highly educated parents who are vaccinating less and that “newly minted pediatricians” are less enthusiastic about vaccines than older doctors. Perhaps that’s because younger doctors are more likely to have grown up seeing all the chronic illnesses that affect today’s children. Too bad the job of kicking people out for asking Dr. Offit a question he can’t answer is already taken. Throwing me out of such lectures has apparently become pharma’s new strategy; Seth Mnookin just recently booted me out of a public conference on ethical research. I'd like to see a bunch of skeptics show up, politely listen to Andrew Wakefield's talk, and then during the questions and answers session ask him the hard questions. One such person showed up, asked questions, and interrupted Dr. Wakefield twice (while confusing the Lancet paper with an entirely different study). Yet no one attending the lecture was thrown out. But while Offit’s poor performance may be supported by his priggish fans, history suggests it will not help his image. One person who I am especially pleased was in the audience at Paul Offit’s talk was his son, witnessing firsthand how his father deals with questions he can’t answer and the people who ask them. Yes, covering up vaccine injuries is okay, just like throwing someone out who asks a challenging question is also okay. To Paul Offit, the ends justify the means. It’s all about protecting vaccine industry profits. Speaking of profits, after he claimed to have no financial conflicts to disclose at the beginning of his lecture, he then bragged about his involvement in the development of the rotavirus vaccine. He also had a lot to say about vaccines and autism and brought up Dr. Andrew Wakefield’s Lancet paper, misstating that it had eight subjects; in reality it had 12, just eight whom had developed autism shortly after receiving their MMR vaccinations. Dr. Offit also falsely stated there were only eight subjects in the Lancet paper when he appeared on The Colbert Report nearly a year ago. But Offit then went on to acknowledge that it was a “simple case series” and not a study. Indeed, it was only good for hypothesis generating, not hypothesis-testing. There was nothing about this paper’s subject size that made it invalid, in contrast to the talking points of Offit and friends. The reason there were so many authors was because the children were so sick that they required a variety of medical care from many different specialists. Nowhere in that quote did Dr. Wakefield say the MMR vaccine causes autism, rather that its safety was understudied. At that time in the UK, the MMR was available in the form of three separate shots, the use of which he supported. Dr. Offit said that Dr. Wakefield’s Lancet paper was “bad science” but wouldn’t say why. What struck me was that Offit completely avoided Brian Deer and the BMJ’s fraud allegations. His use of "would" to imply an inclination rather than "Wakefield said no" is interesting. It appears to reflect his belief rather than having any basis in fact - more from the gospel according to Paul. Clearly, this is an anti-scientific, morally bankrupt position Offit supports. He cited a dozen such studies he claims show the MMR vaccine does not cause autism, the first being Brent Taylor’s, which ignored the first children to receive the MMR vaccination in the UK –and in doing so – ignored increasing autism rates that correlated with MMR’s introduction. Taylor also did not mention a cluster of reported parental concern about their children within five months after that vaccination and he turned down a request by Dr. Bernard Rimland to independently assess the study data. The second author for that study, Elizabeth Miller, sat on the Joint Committeee on Vaccination and Immunisation (JCVI) that approved a brand of the MMR vaccine knowing it can cause viral meningitis. She continues to try to cover up the link between autism and the MMR vaccine. Offit’s list of references also included the study by indicted fraudster, Poul Thorsen, that did not report that the MMR vaccine is associated with a 45% increased risk for an autism diagnosis and a 2.5 increased risk two years after administration of the MMR vaccine. In fact, the risk of autism in children who received the MMR vaccine at all categorized ages was higher than in the non-MMR-vaccinated group. When McGill biostatistician Dr. Samy Suissa sent a letter pointing this out to the New England Journal of Medicine, they censored it from publication. Finally, Offit included the Smeeth et al. study, which the authors knew well in advance was too underpowered to determine if the MMR vaccine is associated with autism, yet it’s continually used as evidence of no link. The rest of the studies Offit cited were thrown out as uninformative either by the 2005 Cochrane Review, the recent 2011 IOM Report, or both. Indeed, all of these studies were created to cover-up a link between autism and vaccines. Paul Offit, who consistently opposes debate against his point of view, claimed that Evidence of Harm author David Kirby should not have been allowed on NBC’s Meet the Press to debate Harvey Fineberg, the President of the Institute of Medicine (IOM), of which Offit is now a member. Some background on the Institute of Medicine (IOM): In 2004, the institute released a report with a preconceived conclusion that mercury-based Thimerosal in vaccines does not cause autism. The IOM Committee Chairwoman, Marie McCormick, said way back in 2001 that the committee “will never come down that it [autism] is a true side effect” of thimerosal. The report relied mostly on the fudged studies of Thorsen and colleagues. McCormick now sits on the National Vaccine Advisory Council with James Mason, the former CDC director who is now a trustee of a group that claims to faith-cure homosexuality. Defending his institute’s bogus report, IOM President Fineberg lied on Salon that none of the review panelists had ties to CDC or pharma when many of them did. Pharmaceutical companies continue to be protected from all vaccine liability by federal law. “But you can’t go on these shows, tempting as it may be, because basically Oprah is there to tell a story. Her story has three roles to play. There’s the hero, the victim and the villain. Jenny [McCarthy] is the hero; her son is the victim. This leaves only one role for you. So you can’t…I mean, you’re just the guy to tell her she’s wrong. And, and she knows the cause of autism; you don’t. She has many cures for autism; you have none. You’re just the guy to say no. Of course, McCarthy’s son, Evan, is a victim because he nearly died of a seizure disorder and regressed into autism following his MMR vaccine. Medical treatments not sanctioned by Dr. Offit successfully recovered Evan from autism, though not from his seizure disorder. Dr. James W. Colbert had joined the faculty as the first vice-president and provost, and he envisioned a new integration of medical education and medical research to make MUSX a nationally recognized academic institution. He began by recruiting prominent researchers. One of the first was his friend Dr. Albert Sabin, famous for developing the live polio vaccine that eliminated the crippling disease in America. Ironically, Sabin’s live polio vaccine proved to cause polio paralysis in some recipients and was eventually replaced with the inactivated version. Also ironic is that James Colbert died in 1974, before vaccine manufacturers were indemnified against litigation and the vaccine schedule exploded. Stephen Colbert is named in the book’s acknowledgements for his interview about his father. The comedian is apparently the vaccine industry’s response to Bill Maher and Jim Carrey. Colbert may be funny, but the swat team of Offit and Palmore is also quite entertaining. They had a little talk about me after everyone was told to leave the room for pizza; Offit started the exchange - caught on camera (59:42). And thus ended the “Great Teacher’s” lecture.